The UAE-based Prime Hospital and Prime Medical Center were recently awarded at the Annual Health Awards 2018 as one of the most ‘Distinguished Hospitals+’ and ‘Distinguished Clinics’ in the UAE in recognition of their contribution to the region’s healthcare industry. 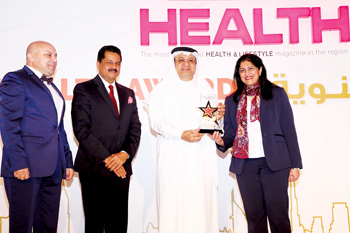 The second edition of the awards was jointly organised by the Dubai Health Authority (DHA) and HEALTH magazine in line with the ‘Year of Zayed’ initiative. Prime Hospital and Prime Medical Centers joined the 35 outstanding achievers and 17 healthcare trendsetters during the award ceremony held at Grand Hyatt and celebrated with over 1,000 attendees including government officials, healthcare pioneers and professionals around the region, as well as Arab and Bollywood celebrity guests. Prime Healthcare Group is amongst the UAE’s leading healthcare service provider and a well-known brand with its team of over 350 physicians and 1000 supporting professionals providing state-of-the-art medical care to the UAE’s citizens and residents.